This week the first consignment in 2017 of pedigree in-calf Hereford heifers destined for Russia departed these shores. 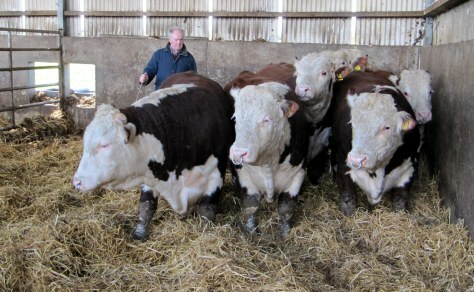 A specially selected group of in-calf heifers of diverse pedigree from herds across the country including eight eighteen to twenty month old bulls brought together by Hubert Maxwell, Livestock exporters have been in quarantine for the past month. All health requirements being fully completed to the satisfaction of the importers the signal to move was received. 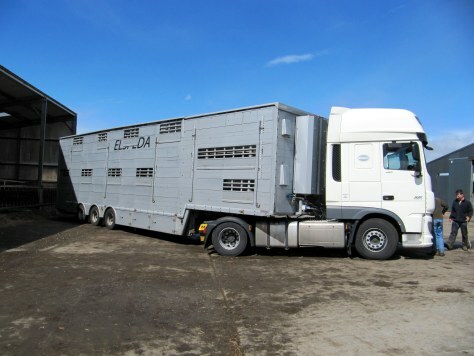 The luxury transport for the Hereford consignment to their new home is provided by a Lithuanian company with extensive experience of cattle transport across Europe. The journey will take one week including rest breaks on the route through France, Belgium, the Netherlands, Germany, Poland and Belarus to the final destination just 180km west of Moscow. The Russian Hereford breeders who have purchased the cattle came to Ireland in January last to visit a number of farms and see the quality of animal available and were extremely satisfied with the standard. Svetlana Koss who hails from Moscow has co-ordinated the project on this occasion said she was extremely pleased with both the quality of the cattle and with how the current project has worked out. 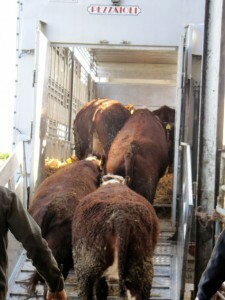 A further consignment this time of over 100 in-calf Hereford heifers arrived almost immediately at the quarantine facility replacing those heading for Rosslare. The testing at quarantine is quiet extensive but Svetlana is with Michael Maxwell confident that this further consignment will again go through without any major hitch. Irish Hereford Society chairman Willie Branagan was very pleased with the progress to date on this export order and is confident of further similar orders including maiden heifers later this spring. 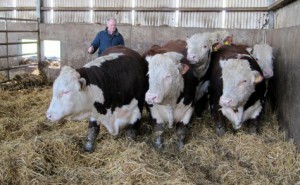 The Hereford cattle exported will allow the expansion and rebuilding of the beef cattle population in Russia which has huge possibilities for development into the future he said. 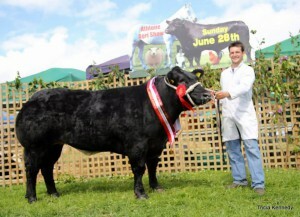 ‘Midnight Express’ owned by Derek & Mark Maxwell, Ballinagare, Roscommon is the 2015 recipient of the Commercial Cattle Exhibitors Society RDS Senior Champion of Champions Award. The Maxwell Brothers commercial herd is recognised nationally for its breeding excellence. The herd first established in 2002 when their grandfather Hubert Maxwell purchased their first foundation heifer. Since then the herd has been built on solid cow families with breeding emphasis on using the best genetics to create exceptional show stock that ultimately will compete for the Red Ribbon. The Maxwells have been tremendous support of the shows throughout Ireland and feature prominently on the summer show circuit and fatstock sales. 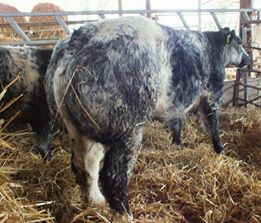 Midnight Express a Belgian Blue, Limousin cross heifer acquired by the brothers as her quality and potential for the future was quickly recognised by both Derek & Mark. Midnight achieved considerable success in 2015 to include 3 All Ireland Champion titles, 7 Championships, Reserve Champion at the AIB National Livestock Show as well as numerous best in class awards. Two heifers destined for the East of England had to camp down in Scotland over night due to snow leaving transportation more difficult that usual. 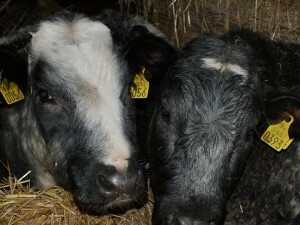 Proving to be worth the wait Semere Commercials were very happy with there two new additions. We wish them the very best of luck with there new purchases. IT’S a long way from Roscommon to Kazakhstan. But that’s where 300 head of cattle are travelling over the next 12 days. 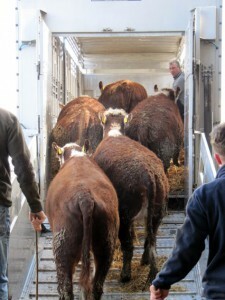 Yesterday the pedigree Hereford and Angus cattle were loaded on to lorries to begin their 6,500km trip to a farmer in Kazakhstan in the former Soviet Union. Their seller, Hubert Maxwell (73), from Ballinagare in Roscommon, was on crutches yesterday as he oversaw their departure. 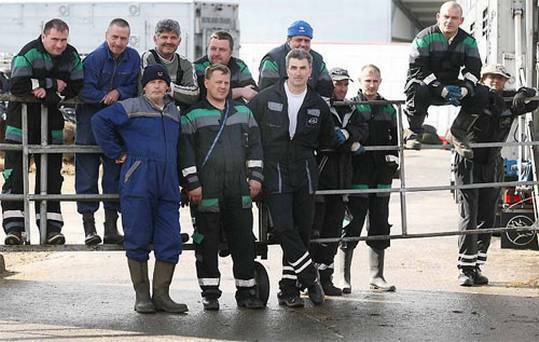 Hungarian Drivers watches the cattle load. But a recent hip operation did not deter him from keeping a close eye on proceedings as 13 drivers from Hungary, Germany and Russia helped load up the animals for the first stage of the trip. “It does cause a bit of a stir in the village,” laughed Mr Maxwell who sent his first shipment to Kazakhstan in August last year. He believes there is huge potential in this export business. When the Soviet Union dissolved in 1991, and Kazakhstan became independent, the economy floundered. Food supplies dwindled and the cattle population fell from 38 million in 1994 to just two million. Mr Maxwell and his two sons Michael and Shane and grandson Derek source cattle from all over the country, buying directly from the breeders. Long before they started exporting to Kazakhstan, they sold cattle to Egypt and Libya until foot-and-mouth disease stalled exports in 1996. As Department of Agriculture officials mingled with non-English speaking drivers outside the two-storey farmhouse yesterday, Mr Maxwell explained that under the regulations the cattle must be taken off the trucks every 24 hours to be fed and watered and rested. His wife Ronny seemed to be running a hotel as well yesterday as she and family members provided a dinner (roast beef, of course) for drivers and other visitors before the grand exodus at around 2.30pm yesterday. “They were supposed to leave from Rosslare last Tuesday night but the storms meant there was no shipping that night,” said Mr Maxwell. Ballinagare has been a bit of a melting pot lately because the Maxwells hosted a group from Kazakhstan two weeks ago who came to see what was available in Ireland. “We took them around the country and they were very impressed,” said Mr Maxwell. The Maxwells sent five shipments to Kazakhstan last year. “We did not lose one animal and we got a special recommendation from the government there. That meant a lot to me as I like things to be done properly,” said Mr Maxwell. The family won’t be having a break after the excitement of yesterday.